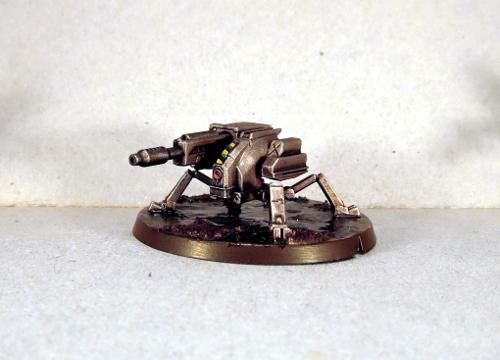 The humble Epirian Drone is a robot of many guises. 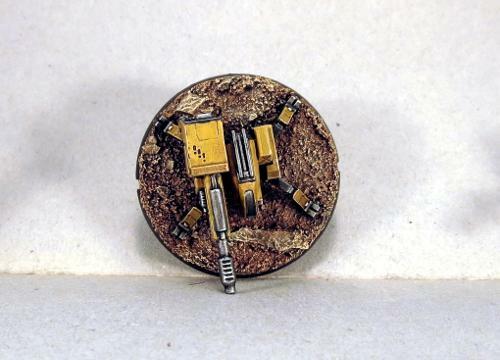 It was designed as a modular core unit that could have an array of different weapons or motive devices in order to create specialised roles as required. 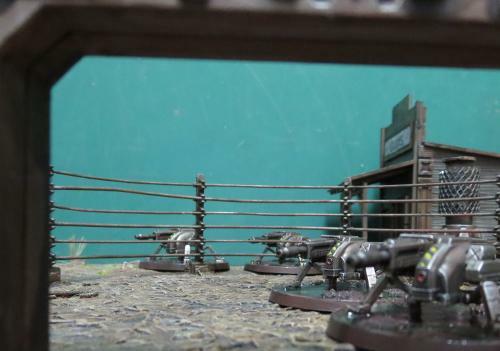 So far in the game we have two of these variants: the Spider and the Firefly. I've had a lot of fun, however, thinking about ways to modify the kit to create other variants, and of the potential things that bored or desperate engineers on frontier worlds might come up with to make their drones fit new roles. 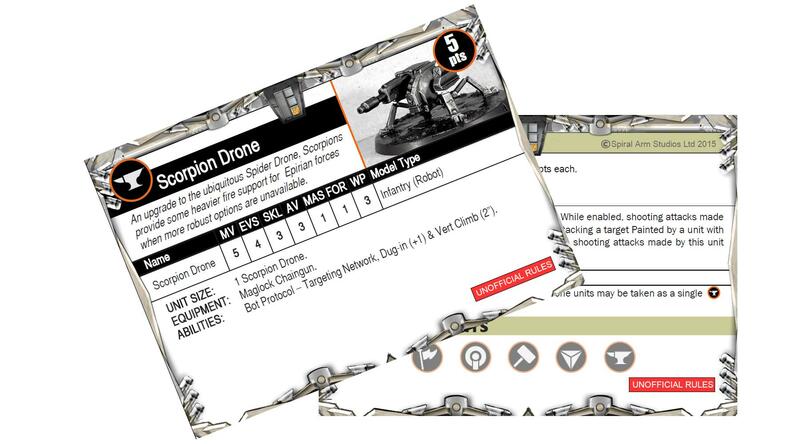 This week, I'm presenting one of the variants that I created: the Scorpion Drone. 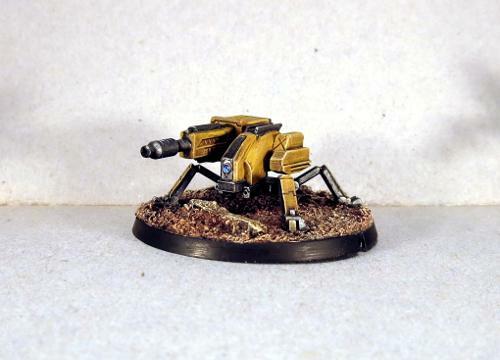 Armed with a hefty maglock chaingun, the Scorpion fills a heavy support role when there are no Hunters around to do the job. 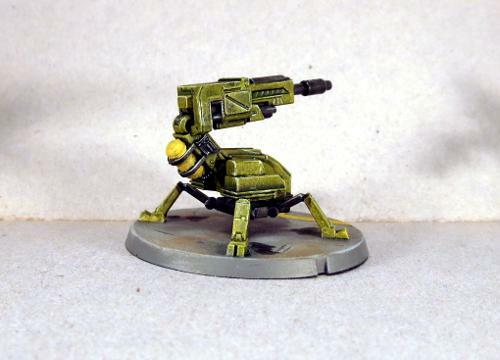 This is a fairly simple conversion, using most of a Drone (legs, chassis, left-side nacelle, rear plate, base) and a chaingun and left-side magazine unit from a Hunter - You could use the right side, but I've used the left as it is a leftover part if you build the Hunter with his hydraulic fist. 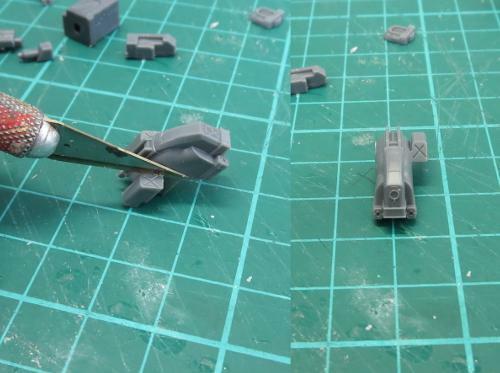 Using a sharp knife, cut the rectangular pod off the right side of the drone chassis. 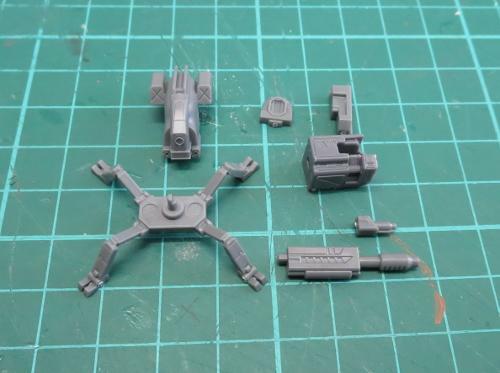 Assemble the drone parts as normal. 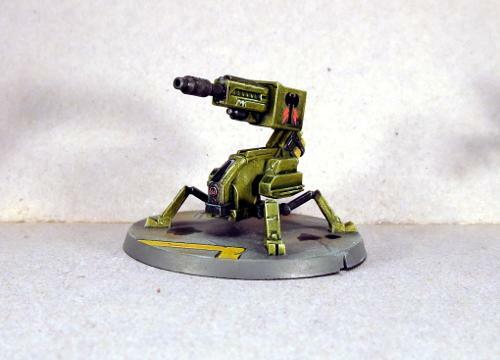 Assemble the chaingun with the magazine unit upside-down. This helps to conceal the elbow joint cavity, and means that the side glued to the drone chassis is the side with no detail on it. 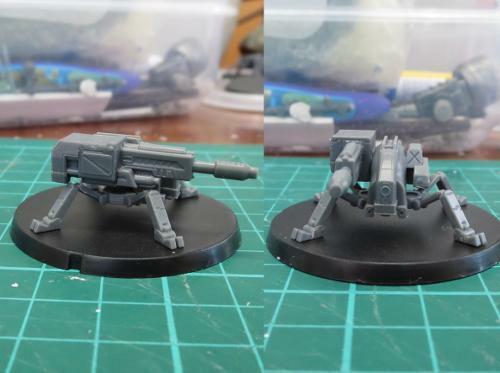 Glue the chaingun onto the chassis. 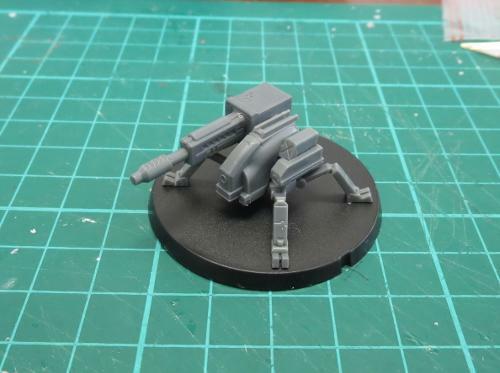 It should sit with the rear of the magazine unit a couple of millimetres back from the rear of the drone, and the top of the magazine unit more-or-less level with the top of the rails on the chassis. 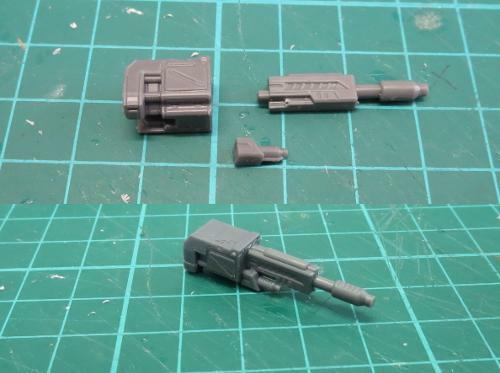 The ejection port will line up with the rear left knee. And that's it - job's done! 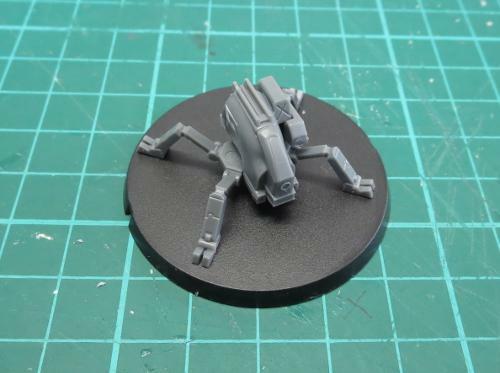 This version uses the chemtek sprayer from the Scarecrow kit to create more of a scorpion's tail for the weapon. I decided to go with the second variant partly to make it an easier conversion, and partly because I thought the weapon mounted on the side looked a little more in keeping with the Maelstrom's Edge aesthetic. The tail is fun, but a little impractical. As always, feel free to share your creations on the Comm Guild Facebook page!